While many people view the kitchen as their home's most important room, it's important not to downplay the value of a stylish, functional bathroom. Whether you have one or three, creating a pleasant bathroom can make a significant impact on your family, friends and guests. While styles continually change, you can easily pull in some trends that have taken hold in the modern bathroom over the past few years. If a bathroom renovation is on your New Year's resolution list, here are some notable design elements to consider for your project. Accent walls and related practices have cropped up throughout today's typical home, with the materials ranging from shiplap to ceramics, so it should serve as little surprise that they've become common within modern bathrooms. Bold tile accents produce a striking impression and create an attractive contrast, which is a growing trend itself. It's also a creative way to express your tastes while complementing your color scheme. You can exercise a great deal of imagination with tile accents. You could coat an entire wall with clean subway tile, or you might selectively implement textured stone as a backsplash around your vanity or in your shower. You can even use them on the ceiling as a unique feature. If you like variety, the Wolf Accents line gives you all kinds of mosaic styles to start your brainstorming process. Our 40-plus designs emulate popular materials like ceramic, metal, brick, and stone, and offer many different design styles. Colors and textures are vital considerations for any accent tiles you might install, but you can take it to the next level with different shapes and patterns. Advanced technology allows you to go beyond simple shapes like squares and rectangles, as you can vary the size and dimensions of individual tiles to create genuinely dazzling displays that add to your new focal point. Modern bathroom design elements include new shapes, and they're even bringing back older ones. Experiment with hexagons, modified chevrons, different circles and fish scales, as well as mix-matched takes on rectangles and squares, to breathe new life into your bathroom. White cabinetry has remained a mainstay within the kitchen and bathroom for decades, and that's still true today. However, darker colors gained some traction in 2018, and people have speculated that it's a trend that will grow within modern bathroom design. Grays, blacks and other darker tones give an excellent contrast for lighter vanities and other features, like the bathtub, toilet, and even accent walls. It can be tricky to balance the dark and light ratio, especially if you're incorporating new elements with pre-existing finishes. That said, it can pay off as a noticeable design choice that gets people buzzing and leaves you with a satisfying place to begin and end your day. Within our five cabinetry lines, you can find numerous dark colors and stains, in addition to the ever-popular whites. We offer various cabinetry options to match your desired profile and the different lines allow customers to select the one that fits best within their budget. 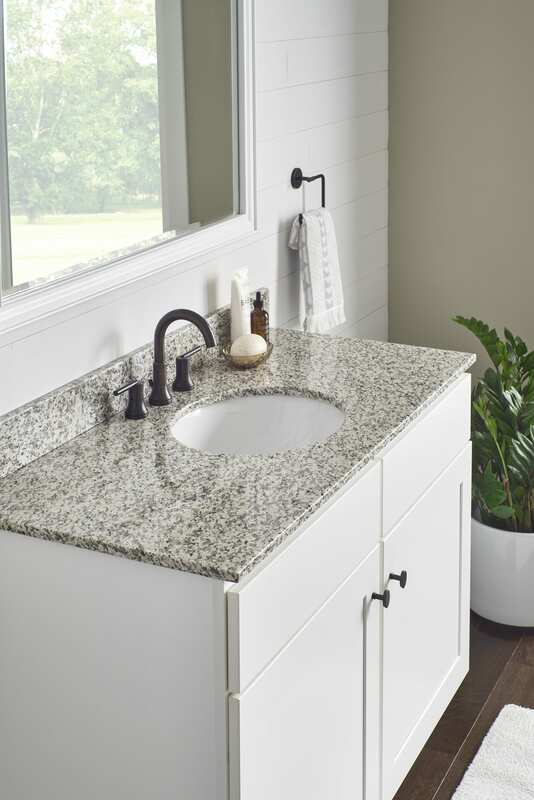 Another intriguing development in modern bathrooms involves the implementation of more marble and quartz, as opposed to traditional options like granite and laminate. People love light and bright spaces, and marble and quartz both give a shiny, clean feel that enhances these tones. They're also less busy and more straightforward, which helps to fit in with popular monochrome layouts. The smooth lines and feel give a spa-like quality to many bathrooms, which people crave in times of increased stress. 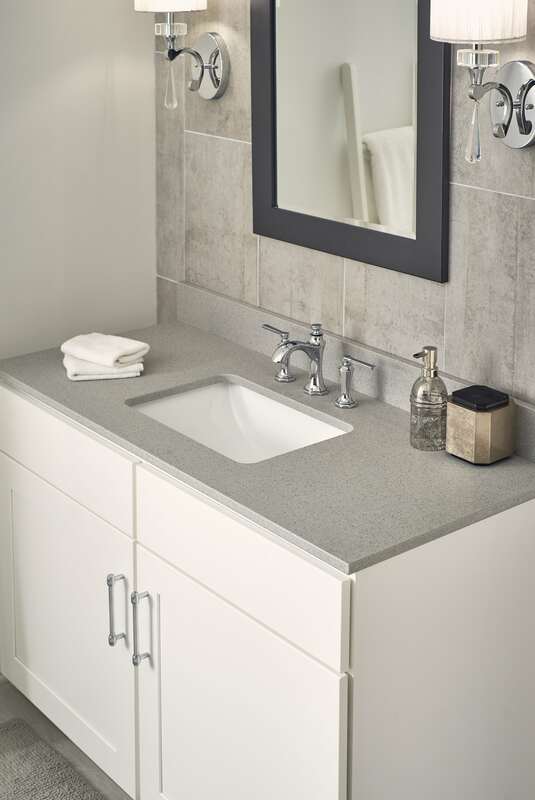 Wolf offers cultured marble and quartz options as part of our Vanity Tops line, where you can find various shades and designs to meet your specifications. Kitchen and bath products from Wolf Home Products can meet demands for the bathroom design you envision. Contact a Wolf dealer in your town to discuss your options today.